SIGNAL is the last surviving signal box in Flinders Street Station, the new construction emerges from the shell of the former signal switching building. Once decommissioned, SIGNAL was damaged by fire twice and remained an unusable space before the City of Melbourne recognised its potential. The box was converted into an arts studio by using simple environmental concepts and efficient design. Today, SIGNAL is a creative studio for young people and emerging artists. The program provides opportunities and spaces for art making, exploration and showcasing. SIGNAL is a place for young people to stake a claim to, and contribute to, the creativity of the city. The SIGNAL building functions as a projection screen after-dark. 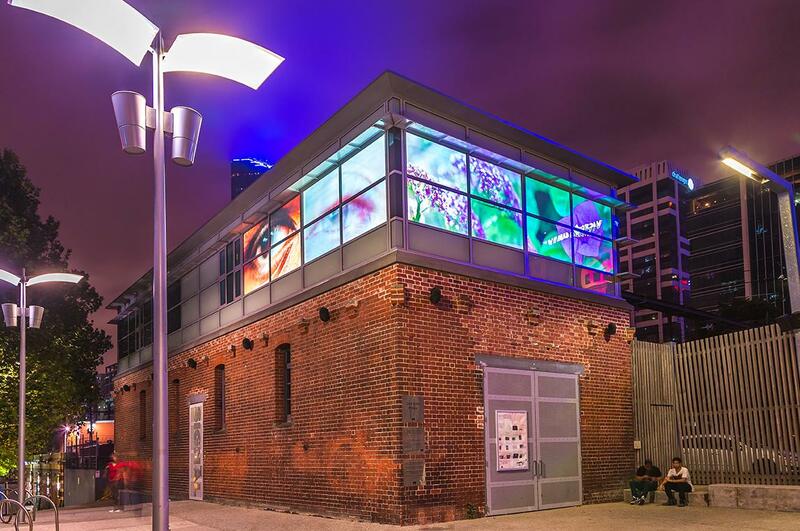 Efficient LEDs illuminate the modern reinstatement as a beacon along the Yarra River. Works created by young artists are showcased on the SIGNAL Screen throughout the year. The building performs well with simple environmental concepts, including: fresh air; night purging heat; thermal mass and phase-change material to access the embodied energy stores; low VOC finishes; rainwater collection (which is used for flushing toilets); and reclaimed timber (from city parks). Transport: Tram stop 1: Queensbridge St/Flinders St on route 55. Train station: Flinders St Train Station via all lines"